St. Francis borrowed the Tau and what it meant to him from the Antonians. They were a religious community of men founded in 1095 whose sole function was to care for lepers. 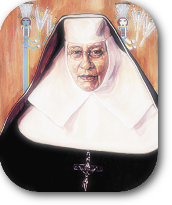 They were disbanded as an Order by the Church in the 1500’s because leprosy was no longer a problem and many of the religious orders had fallen into Theological problems. On their habit was painted a great Tau cross. Francis was very familiar with these men because they staffed the leper house in Assisi and the hospital of St. Blase in Rome where Francis went to stay. This is now the church of San Francisco A Ripa. Every time you see St. Anthony, “the Abbot or Hermit” in art, he is portrayed with the Tau. Pope Innocent III opened the Council on November 11, 1215, with these words: “I have desired with great desire to eat this Pasover with you.” (Luke 22-15.) 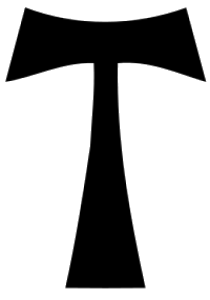 Innocent announced that for him, for the Church, and for every Catholic at the time, the symbol they were to take as the sign of their Passover was the Tau Cross. He incorporated into his homily the statement from Ezekiel (9:4) that the elect, the chosen, those who are concerned will be marked with the sign of the Tau. He explained that this Passover is a three-fold Passover. Every Catholic must be involved in this triple Passover: A Corporal Passover, a Spiritual Passover and an Eternal Passover.